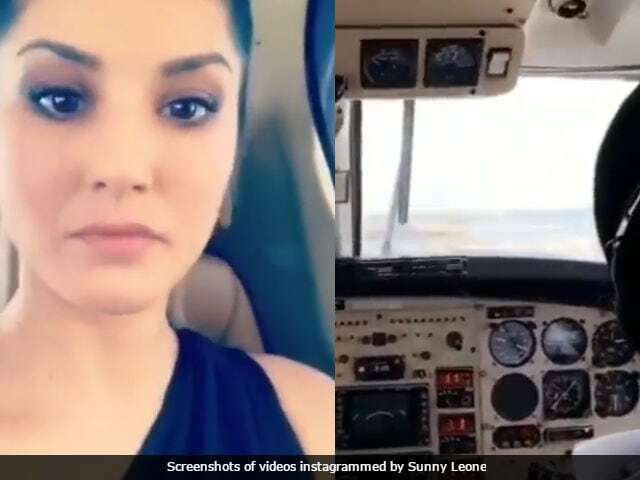 A day after Sunny Leone shared that the private plane ferrying her 'almost crashed,' the 30-year-old actress instagrammed two videos from her mid-air 'harrowing experience.' She shared the videos and wrote: "The harrowing experience. Have to thank the pilots for doing such an amazing job getting us through and alive. But you know it's bad when the pilot starts praying mid-air." In the first video, Sunny Leone shared the reactions of her co-passengers, which included her husband Daniel Weber, and in the second video she shared the view from the cockpit. Due to deteriorating weather conditions, the pilot landed the aircraft in Aurangabad, from where Sunny Leone journeyed back home by road. A source told news agency PTI that the pilot flying five-seater Beechcraft King Air C-90 plane, owned by Surat-based air charter firm Kiaan Airways, took a detour to Aurangabad to collect extra fuel in case they were required to re-route during their journey. However, due to bad weather conditions, the pilot decided not to complete the trip. Sunny Leone and her husband were travelling from Latur to Mumbai. On Wednesday evening, Sunny Leone tweeted about her mid-air "harrowing experience" and later about her tiresome on-road journey from Aurangabad to Mumbai. Here are some of the tweets from her road journey. Been on the road for 6hrs now trying to get back to Mumbai. So exhausted! Sunny Leone was last seen in a cameo in Sonakshi Sinha's Noor. Earlier this year, she featured in Raees song Laila O Laila. Her upcoming films are Baadshaho (for a special song appearance) and Tera Intezaar.